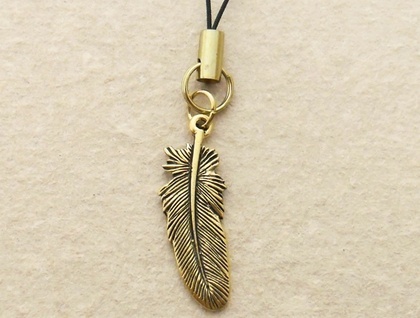 This cellphone charm features a graceful, lifelike, double-sided feather charm. The feather is made of pewter that has been plated with gold and then antiqued (artificially aged) to bring out all its realistic details. The strap is black, and some of the metal parts are gold coloured while others are gold plated. 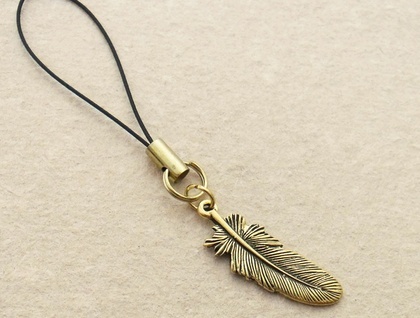 Measurements: strap length is 45mm; total length is 90mm; feather charm is 29mm from top to bottom, including the baile (the little hanging loop at the top). 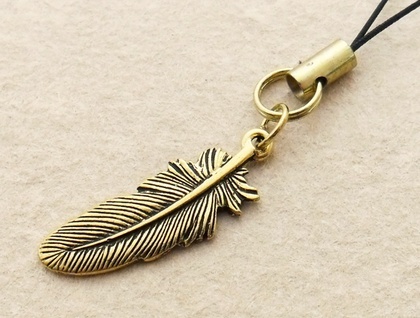 Many newer cellphones and smartphones do not have a hole in their casing for a charm strap to be threaded through. They do, however, have an audio jack for earplugs, and into this jack can be inserted an audio jack plug, which has a ring in the end through which a cellphone charm's strap can be threaded. As a bonus, using a plug helps to keep dust and dirt out of your audio jack. If you need an audio jack plug, just let me know in the 'notes for whiteleaf' field that will appear when you check out of Felt. I'll include one in your order at no charge. It will be a simple plug of black plastic with a silver-coloured ring. Cellphone charms aren't just for hanging on cellphones – they can be hung from bags, backpacks, keyrings, pencil cases, luggage, purses, zippers, Christmas trees, drawer knobs, etc. They make lovely little gifts and are easy to post. They can even form part of your gift-wrapping as a garnish, tied into the ribbon or dangling alongside the gift tag. Earthy, eclectic adornments for nature lovers. Contact whiteleaf to enquire about payment or shipping options. 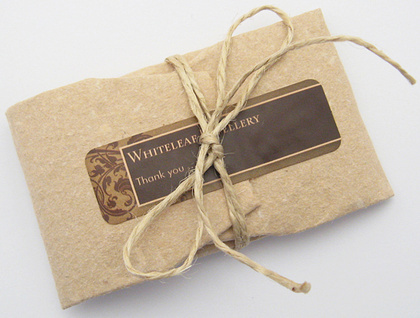 Whiteleaf Jewellery – earthy, eclectic adornments for nature lovers.